St. Matthew’s Church has a long history of serving Kenosha in God’s name – and – of making a joyful noise to the Lord through music. Mary Hinsdale, the daughter of the parish’s first rector, the Reverend Frederick Hatch, was the parish’s first organist. The soft sound of the Jardine organ resounded through St. Matthew’s Church(es) for the next 80 years. In 1871, the present church site was purchased for just over $2,000. The groundbreaking ceremony for the new church was held on July 1, 1872. It was completed in 1878. Fifty-two years later, on December 8, 1924, the parish purchased its historic four manual Skinner Organ for $29,800 from the Ernest Skinner Organ Company of Boston, Massachusetts. (The original purchase contract is still on file in the parish office.) The organ was installed in 1925, under the supervision of E.M. Skinner himself. 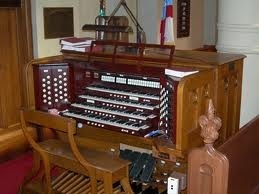 It has been estimated that today it would cost close to $600,000 to replace the Skinner Organ in St. Matthew’s. By the way, the Jardine Organ was donated to the Church of the Intercession in Stevens Point where it served that parish for almost 30 more years. Ernest Skinner was considered to be the finest organ builder of his time. Skinner’s organs were characterized by their excellent craftsmanship, great warmth of tone and lush romantic sound. Skinner Organs grace the campuses of Yale and Princeton as well as many churches all across the country. In the past few years, Skinner Organs have become objects of major attention by organ scholars, authors, enthusiasts and historical societies because of their combination of elegant simplicity and sophistication. Interestingly, St. Matthew’s Skinner Organ, replete with the Erzhaler Stop designed by Skinner, may have been one of the last manufactured by the Skinner Organ Company while Ernest Skinner, who founded it in 1901, was still in charge. In late 1929, following some business differences with a company colleague, Ernest Skinner sold off all of his stock and used the proceeds to buy the Serlo Organ Hall, north of Boston, which had an adjoining factory. He was going to start up a rival organ manufacturer. One previous renovation took place with the Skinner Organ at St. Matthew’s. That was in the 1960s when the Verlinden Organ Company of Milwaukee moved the choir organ to the east organ chamber above the console and put the solo organ in the west organ chamber. The aging process inevitably took its toll on St. Matthew’s Skinner Organ. Around the turn of this century, it became apparent to the rector at St. Matthew’s that the Skinner would have to be refurbished or lost forever. The parish agreed that the expensive undertaking was worthwhile, sensible and advisable. It was decided that the Skinner Organ is a valuable work of art in its own right and an artifact that should be passed on to future generations of St. Matthew’s parishioners. The T. R. Rench Company was contracted to do the slow, painstaking work of making the now almost 80-year-old organ with 44 ranks of pipes sound brand new. Tom Rench masterminded and planned the refurbishing project; John Jordan and Merritt Rhoads did the day-to-day work. How much work needed to be done on St. Matthew’s Skinner Organ? The specifications of the organ-refurbishing project take up almost two full 8×10 pages! Some of the major work included completely overhauling the existing console, chimes, harp stop and bellows. The rich organ sounds come from air being pressed through the pipes. This happens as air passes through the valves in the windchests, the oblong boxes the pipes stand on, and then into the pipes. The valves in this organ are caused to work by the pressure of the air in the windchests and are made of leather and felt. Each and every piece of leather, not only in the windchests but also in the harp and chimes, therefore, needed to be replaced in order to restore the Skinner Organ to its former glory. This was no small job, and it took nearly two years for the work to be completed. All the necessary pipes were repaired; all the pipes were washed. The pipes were also voice-checked to ensure proper tone quality and power. The entire organ was fine-tuned not once – but twice! While it doesn’t look any different from the outside, the inner workings of the console were entirely removed and replaced with state of the art technology. In addition to the restoration, the rector thought that bringing the Skinner Organ into the 21st century was also important, so the newly refurbished organ was enhanced with a MIDI, a Musical Instrument Digital Interface, that allows for programming organ music as well as programming the 14-bell carillon in St. Matthew’s bell tower. Tom Rench’s promise to St. Matthew’s was that “all the work will be done so that the original tonal characteristics of the wonderful instrument are preserved.” To hear music played today on this magnificently refurbished Skinner Organ is testament to that and to the God-given gifts of Ernest Skinner and the staff of the T. R. Rench Company. Our beautiful sanctuary provides a special setting for vocal performances. St. Matthew’s is a venue that is sought out for performances and recitals by regional choirs and musical groups. Over the years St. Matthew’s has been the home to many talented and gifted musicians. We are very proud of our musical ministry. We are also proud of our multi-generational church choir. Kay Sutton is the organist and choir director at St. Matthew’s. The choir sings every Sunday at the 10:30 a.m. service (September through May) and at special services. Rehearsals are on Sunday mornings after the 10:30 service. New choir members are always welcome. Persons who are interested in joining our choir are encouraged to contact the church office.